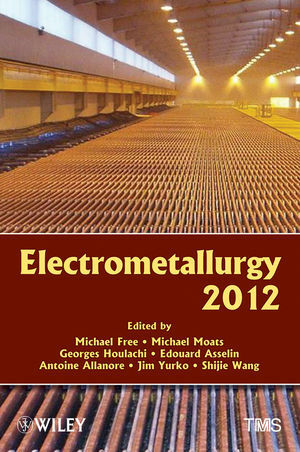 Electrometallurgy 2012, edited by Michael L Free, Michael Moats, Georges Houlachi, Edouard Asselin, Antoine Allanore, James Yurko, and Shijie Wang, ISBN: 978-1-1182-9117-7, published by Wiley, $ 138. 111 River Street, Hoboken, NJ 07030-5774, USA. This is the proceedings of a symposium sponsored by TMS Extraction and Processing Division, TMS Hydrometallurgy and Electrometallurgy Committee, and The Metallurgy and Materials Society of CIM and held during the TMS 2012 Annual Meeting & Exhibition Orlando, Florida, USA, March 11-15, 2012. It is focused on fundamental research, development, and/or application of innovative aqueous or molten salt electrometallurgical technologies for the extraction, concentration, refining of metals, and recycling from scrap or waste. The book starts with an excellent review article written by the editors entitled, “Electrometallurgy - Now and the Future” with 41 references. 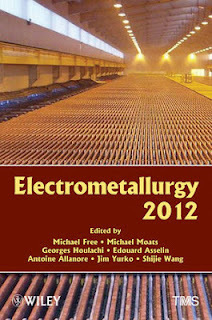 The remaining 24 papers cover different aspects of electrometallurgy. For example, A Novel Oxygen Evolution Anode for Electrowinning of Non-ferrous Metals, Lead Anodes Performance in Nickel Electrowinning, Electrometallurgy of Enargite, etc. The book is very well produced and is a welcome addition to the metallurgical library. Editor Houlachi is with Hydro-Quebec, Allanore with Massachusetts Institute of Technology Free and Moats with University of Utah, Asselin with University of British Columbia, Wang with Rio Tinto Kennecott Utah Copper, and Yurko with Materion Brush Beryllium and Composites.